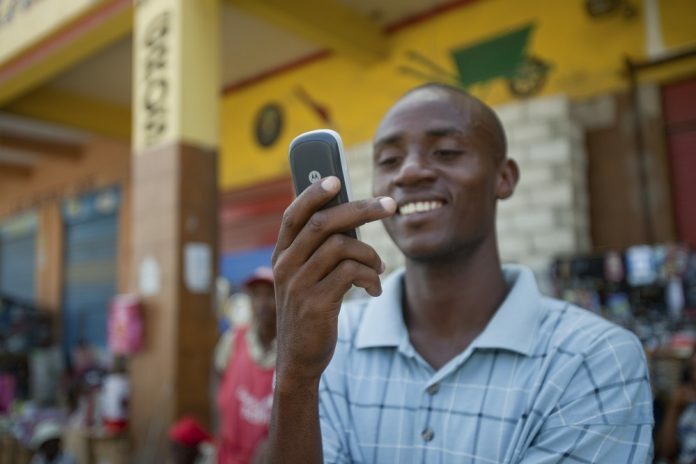 Electrical Student, Jean Louis Thomas writes a text message to a friend downtown Port-Au-Prince, Haiti, June 5, 2010. Send with Care, a micro insurance joint venture between MMI Holdings and MTN Group which was announced in September this year offers an insurance cover “aYo Send with Care and aYo Recharge with Care” for every transaction you make via MTN Mobile Money. Once you add “aYo Send with Care Cover” to the money you send with MTN Mobile Money, aYo will triple every amount you’ve sent, and pay it out directly to your beneficiaries in case you pass away or be hospitalized. The payments are made in 12 equal monthly installments, which expires 120 days after purchase. For instance, when you send 30,000 UGX to Tom, aYo will triple this to 90,000UGX. Therefore, the more transactions you send, the more your cover increases. All you need to do is send at least once every 120 days to ensure your beneficiaries are always covered. Anyone with an MTN Mobile Money account can Send with Care. Dial *165*1*4# to access the aYo Send with Care menu to get started. Follow the prompts to continue…. Once you sign up you mobile phone for aYo Recharge with Care, you get 30 days free cover every time you load MTN airtime. The more airtime you load, the more your cover amount grows. Life cover pays out to your family in the unfortunate event of your passing, and hospital fees pay straight into your MTN Mobile Money account if you spend one night or more in hospital due to an accident. Dial *296#, and choose the first option (Sign Up). You’ll need to choose the type of cover you’d prefer; MyHospital where you’ll receive your MyHospital cover in full, paid out directly to your MTN Mobile Money account to help you take care of hospital bills, or MyLife to look after your family and take care of school fees, funeral expenses or other household expenses once you pass on. You can change this cover at any time or boost your cover so you have both. For every entry, follow the given prompts to finish up with registration. Select a beneficiary for your aYo Recharge with Care policy. Should you ever pass away, they will receive your MyLife cover payout. Choose a friend or family member to act as MyCaretaker; person does not have to be MyLovedOne, but they must be able to handle your affairs if you are unable to do so.